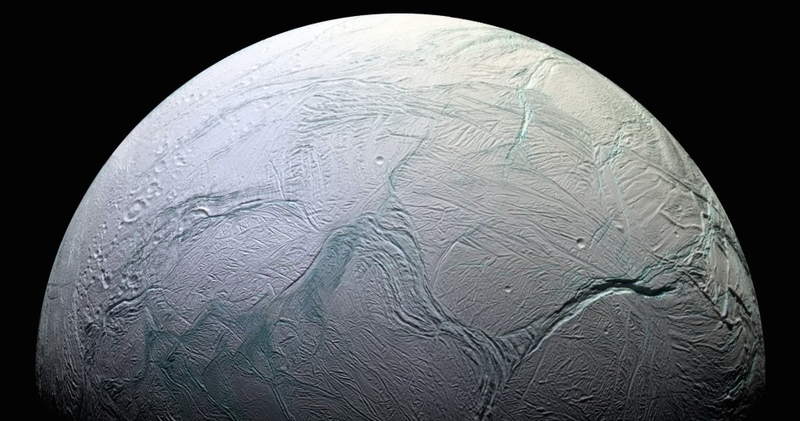 Step aside, Europa: Enceladus is now the coolest of moons. And our best bet at finding alien life. We had always suspected that Enceladus had liquid water, but now there’s proof: a team of Italian and American researchers has just published a paper on Science, after looking at how the moon’s gravity affected the flight of NASA’s Cassini probe, currently exploring the Saturn system. Under the icy surface of this moon of Saturn lies a liquid ocean the size of Lake Superior, or larger than Switzerland. Because of its distance from the Sun, the surface temperature of Enceladus is about -200 °C, and it’s covered by a thick crust of ice. So how can there be liquid water? Because tiny Enceladus is caught in a gravitational tug-of-war between Saturn and another moon, Dione. It gets pulled by one and the other alternatively, and this cracks the icy surface, creating friction and heat. More heat is released by radioactive decay in the core of the moon, and this warms it up enough to allow water to remain liquid between the core and the ice. The most interesting thing about this discovery is that it stems from a curious property of water itself. Gravity at the South pole of Enceladus was found to be weaker, which was expected because of a depression. But the depression is so large that gravity should have been even weaker. So, something under the ice must be compensating. Something with a bit of extra mass. Liquid water. But how can liquid water be heavier than ice? Unlike most substances, water becomes less dense when it freezes. You would expect it to do the opposite. But if it did, there would be no life on Earth. Ice floats on water precisely because it is less dense; if it were the other way around, instead of just getting an ice layer on top, the oceans would freeze from the bottom up, killing all aquatic life. The very property of water that is essential to life here on Earth may lead us to find it on a distant moon. Liquid water is about 8 percent denser than ice, which is why soda cans explode if left in the freezer. Water has many such unusual properties, some of which are instrumental to life. And life as we know it depends on several elements, but essential to all living things on Earth are carbon, hydrogen, oxygen, sulphur and phosphorus. We already know from Cassini that Enceladus has salts and organic molecules, but water is also a universal solvent, so its underground sea may contain key minerals dissolved from the rocky core, creating a suitable medium for life. Enceladus is one of Saturn’s 62 known moons, and at about one tenth the size of the largest, Titan, it is rather small: about 500 kilometers in diameter. It holds the distinction of being the brightest object in the Solar System: due to the icy surface, the amount of light it reflects, or albedo in astronomy parlance, is close to 100 percent. Now it also holds the distinction of being our best chance at finding extraterrestrial microbial life. Europa, one of Jupiter’s largest moons, is also thought to have underground oceans, but we have no proof of organic molecules, and its geysers – eruptions of liquid water from underneath the surface into space – are a rarity compared to those frequently seen on Enceladus. The news come at an exciting time for astronomy and astrophysics. Our best theory for the early moments of the Big Bang seems to have received an initial confirmation last month, and a second Sedna, a dwarf planet that orbits the Sun with a very long and elliptical orbit, has been observed a couple of weeks ago. Our understanding of the Universe as a whole, and even more intriguingly of our own Solar System, is evolving rapidly. So what should we do now? NASA already has a project for a mission to Europa, but it would just be a reconnaissance mission, with no attempt to penetrate the ice crust or even land on the moon. It would gather radar data and give us a good indication of Europa’s physical properties, in preparation for a future, more substantial mission. 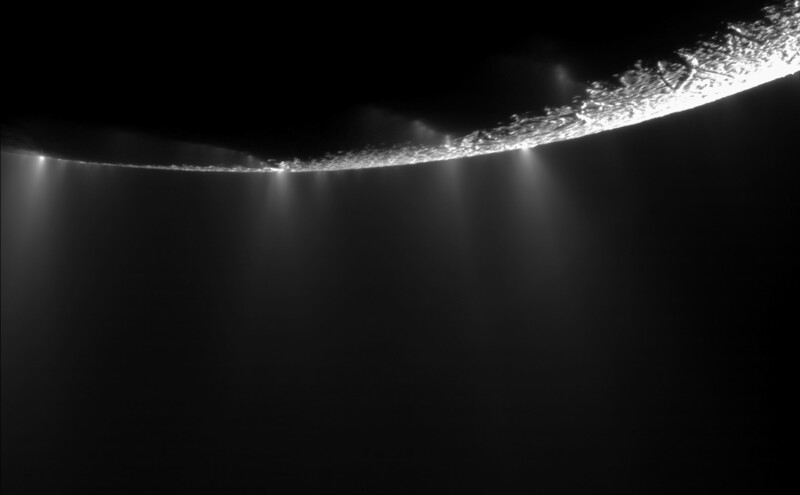 Therefore, it may be better to visit Enceladus, again not landing on it, but capturing the water plumes that spray from it at much more consistent pace than Europa’s. We would get the moon’s water without the need to go through the ice. It would be tricky, because the spacecraft would have to be sterile, not to contaminate the samples, and the samples themselves would have to be quarantined, because for all we know they could be hazardous or infectious here. But they may contain signs of life or its precursor chemistry. And that, as Neil deGrasse Tyson would put it, would really change the cosmic perspective.